Retention is a fancy word for ‘loyalty’. Which customers continue to use your product or service time and again? As a result, you can measure retention using your revenue. But how do you get customers to keep coming back? This guide explores retention strategies you can use to keep your customers satisfied. There are other strategies you can use but we’re focusing on the value of marketing through transactional activity. Your user triggers these emails through what they do. Because they’re related to an action, they help you pinpoint problems in your sales funnel. But wait. Why do I need to keep customers? Can’t I find new ones? You can. But think about all the effort you spent turning a new website visitor into a user. Why would you keep doing that when it’s easier to keep existing users? They understand what you do. And they also understand why what you do is valuable. If they’re not already paying you, they’re about to. You don’t have to work to convince them. But let’s get one thing straight. A customer who pays a subscription but never uses your product is one thing. A retained customer interacts with your product. Let’s use hotels as an example. A guest who books a room in your hotel because they’re passing through and you have a room free is one thing. A repeat guest who always uses your hotel when they’re in town is a retained guest. These guests, or customers, have chosen you above your competition. They’ve often done so because you offer something your competitors don’t. Once you know what this ‘something’ is? You can define the difference between a customer and a retained customer. Those users who pay but don’t use don’t prove there is a need, or demand, for your product. But retained users do. Because they use it. What makes the product so special? Know who your customers are before you can identify those you’ve ‘retained’. But you can also work out at which point they became retained customers. At this point, they grasped the benefit of your product or service and became lifelong fans. We call this core retention behaviour. Once you understand what they were doing when they grasped your service’s key benefit? You can promote that behaviour among other users. How Do I Measure Retention? Glad you asked. You need a baseline before you do anything else. If you are using Websand and are including transactional information into the platform, how home dashboard will help give you a basic overview. But to get that baseline in place, there’s a formula you can use based on the percentage of customers who use your product over time. Take the number of customers you had at the end of a reporting period. Say that’s 6000. Subtract the number of new customers gained during that period – let’s call that 1000. Divide the result by the number of customers you had at the start of the reporting period. We’ll call that 8000. Higher numbers equal better retention rates. That means you’re doing something right. But a one-off number has little value. You need to map this across the course of a year (or longer) to see where you may lose, or gain, more retained customers. If you introduce a new feature and your retention rate plummets? You have a problem. But this is just one way to measure retention. You can also measure your churn rate. The churn rate sounds unpleasant, and it mostly is. It refers to the number of customers that stopped using your services in a given period. To calculate your churn rate, divide the number of customers lost by the number you had at the start of the period. Like the retention rate, the churn rate in isolation doesn’t tell you much. Measuring it across time gives more useful insight. If your churn rate goes down, then you’re losing fewer customers over time. If it goes up? Find out why you’re losing them and plug the gap. It doesn’t matter if you measure churn or retention. You only need to be consistent in your measurement method. How do I Increase Customer Retention? Zoom out from your funnel. Are you looking at retention once they reach that part of the funnel? Retention really begins when a customer first enters your funnel. You’re not entitled to their loyalty and you can only build it over time. Let’s look at three strategies you can try to start the process. Start with the right users. It sounds obvious, but many companies target anyone and everyone. While you may snag good customers by accident, you’re casting your net too wide. Collecting the wrong users leads to a low retention rate. Instead, look at your existing retention rates. Compare your retained customers and see what they have in common. Your ideal customer lies within that profile. Measure your acquisitions against that profile. You’ll see where your marketing comes up short. It’s okay to turn away customers that aren’t a good fit for your product. Use a referral program for a competitor to prove authority and build trust with those users. They won’t use your product but they’re more likely to tell their friends about you for being honest. Are your new users even using your product? If they don’t use it when they first sign up, they probably never will. No amount of retention emails will convince them to use your product if they don’t activate. Work backwards. Improve your onboarding to get customers using your product as soon as possible. Retention strategies remind users of your value. But they need to have grasped that value in the first place. Continue to share blog posts, videos, and other materials related to your product. Make sure it’s practical and useful, not a random aside. This extra education will help solve customers’ problems over a longer period. And it keeps you ‘top of mind’ every time your email drops into their inbox. But How Do I Tackle Retention Emails? We’ve been discussing emails you should send for retention. If your churn rate keeps climbing even after customers activate? That’s the point you need to use these seven email strategies to get them back on board. Notification emails sound dull. But they’re the second most opened emails, after welcome emails. They’re generated by action in the user’s account, so they stand out among general inbox noise. Those actions might include a new follower or a message from a fellow user. It all depends on what your product does. But it gives the user information about their account and gives them a reason to log back in to check. It also shows what interests the user. If they’ve ticked ‘yes’ to receive notifications about comments on their posts? It shows they’re interested in the community aspect of your product. These notifications perform three basic functions. They act as a reminder that the user has an account with your product or service. The email encourages users to interact with the product again. And it does so by using good news, boosting positive associations with your product. But how do I know what to promote with notifications? It depends on your product. 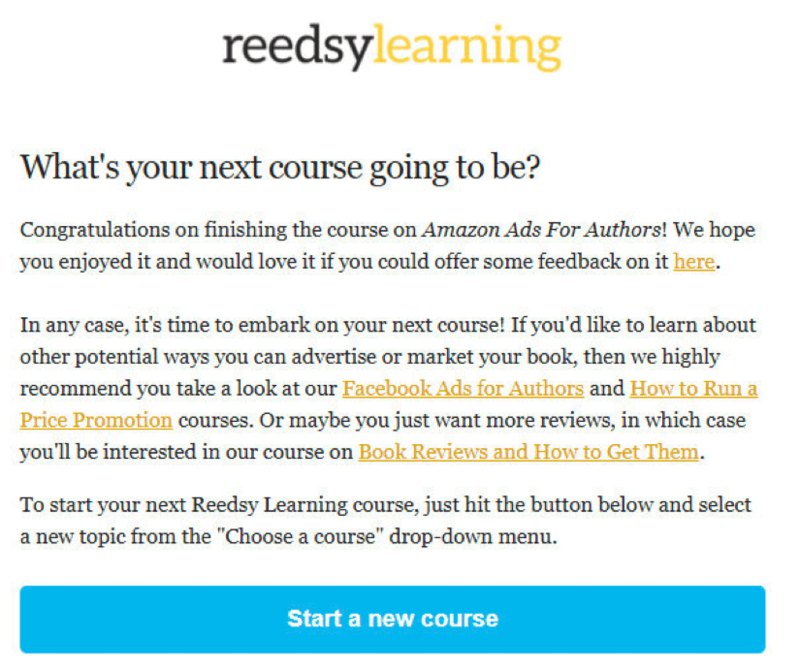 Book production platform Reedsy offers a range of email courses. They’re aimed at helping writers improve their marketing or other aspects of publishing. Their user behaviour is getting writers to take courses. As writers educate themselves about publishing, they realise they need a premium product. They use Reedsy’s marketplace, connecting writers with artists and editors. Your notifications also need to promote specific user behaviours. Wondering which behaviour to promote? You need to know at what point your users grasp the value of your product. If you can, choose something that’s quantifiable so you can measure it. If you can’t, choose a behaviour that aligns with the core value of your product. Have you implemented the advice in our onboarding and activation guide? Then you’ll have educational emails early in your onboarding process. But you want users to continue using your product once that process ends. Chances are, they’ll still have things they need, or want, to learn about your product. Create educational emails containing the valuable information you know about your product. They continue to show the benefits of your product long after you’ve stopped ‘selling’ it. Certain features of any product often end up used less than others. Set up an email sequence to show the benefits of these features to users who haven’t used them yet. It serves as a reminder they have an account. But it also offers more value for features that can benefit them. And roll out this kind of sequence when you introduce new features. Your product might be straightforward. Users follow a short learning curve. But maybe they’d get more out of it with inspiration. For example. Editing and proofreading website ProWritingAid sends emails packed with writing advice. It’s not directly related to the website. Lots of blogs and sites include articles on the art and craft of writing. But users of ProWritingAid care about their writing – that’s why they use the product. This extra educational content helps them achieve their goals. Certain products or services encourage more temporary behaviour from customers. They sign up, use it a few times, and then don’t use it again. Travel websites are a good example. The good news is, just because a customer isn’t using your website every week doesn’t mean they won’t use it again. Using win-back emails, you can make sure they use your product next time they have that need. This email landed in an inbox in July. It also advertises rentals in Venice, a destination favoured by the customer. The customer used TripAdvisor to look up Venetian tourist locations and left reviews. So, it’s a good bet they might want to go back. Using win-back emails encourages inactive users to sign back into your website. Coupons and discounts are a great option – just look at the ‘we miss you!’ emails in your own inbox. Prolifiko, an online accountability platform for writers, used a similar tactic. They’re offering a half-price discount for early adopters. These early adopters are more likely to spread the word after launch. Or you can extend a free trial. This does two things. It gives a reason to use the product. But it also adds a sense of ‘now, not later’. You can also add the option for users to give feedback if they leave altogether. That data helps you pinpoint potential reasons for a high churn rate. Cart abandonment emails are another form of win-back email. These emails go to shoppers who added products to a virtual cart but never bought. On average, customers abandon 69.89% of online shopping carts. There are many reasons customers might abandon their cart. It could be an accident. Maybe they never intended to buy. But they may also abandon the cart because your website is difficult to use. Or perhaps the price was too high. Pinpointing why users abandon their cart (and enticing them back) can help win more sales. Many businesses still use them as news updates. They share content that means little to people outside their company. Other businesses send the same email to everyone on their list. Making them irrelevant for most subscribers. Done well, newsletters can add a bucket load of value to your subscribers. How do you do them well? Newsletters don’t appeal to everyone. Set up segments so you only send newsletters to the users who enjoy them. Those users who don’t like newsletters might prefer regular tutorial videos instead. Ask them and see what they’d prefer. Combine regularity with segmentation by letting customers choose what they want to receive. Do they want them daily or weekly? Self-segmentation saves you time later. Don’t fall prey to the temptation of using your newsletter for a regular promotional blast. The focus should be on value for the subscriber. Hubspot advises that just 10% of your newsletter content should be promotional. Ironically, your newsletter will stand out for not being an endless barrage of ‘buy this’. Give customers something valuable and practical they can use right now. Copyblogger sends a weekly digest of their Monday, Tuesday and Wednesday blog posts. They often also include links to specific episodes of their podcasts. Now you might think “but that’s all self-promotional”. Their content is also free to consume. Reading their posts or listening to their podcasts costs the subscriber nothing. But the subscriber gets so much value from this free content. Next time Copyblogger run a promotion, the subscriber pays more attention. It also lands every Friday without fail so subscribers know to look out for it. Whenever you change something, update your customers so they know what to look for. Product update emails work like notification emails. They’re full of good news that benefits the subscriber and improves their experience. Online education platform Udemy underwent a recent re-brand. They emailed users to let them know about the change. The email redirects subscribers back to their website. That click-through lets the company know who is interested enough in the brand to learn more. But Udemy also lets the users know they inspired the brand. Graphics software company Affinity uses similar emails to update users about new features. Here, the launch of a new website ‘hub’ for their content. The new platform is also full of tutorials designed to help users get the most out of the software. They combine educational emails with product updates to show users how dynamic their products are. We’ve been showing you ways to improve retention. But how do you measure loyalty? The Net Promoter Score (NPS) is one way to do it. It helps you work out the lowest cost of keeping customers. And it uses one simple question. Give them the option to click 0 through to 10. Calculating your Net Promoter Score is easy. Detractors score 0-6. Those who score 9 or 10 are promoters. Work out the percentage of promoters and detractors. Then subtract detractors from promoters. The result is your NPS score. Use it alongside your churn rate to pinpoint problems in your various processes. You can predict problems and also learn what you’re doing well. They’ve gamified the reviews process by incentivizing users to leave reviews. The badges do nothing, other than let the user collect them. But it’s a simple way to get users to log back in and generate more content for the site. Best of all? This is a retention email in disguise. TripAdvisor knows users get the most value out of the user-generated reviews. By asking users to leave new ones, they get users involved with the running of the site. They’re directly involved with the most valuable part of TripAdvisor. The email is easy to write and schedule. If the user leaves a review, it can help boost your retention. All retention campaigns need to do two things. Before you create your retention strategy, work out where the leak is in your funnel. Plug the leak by pinpointing what customers must do to remain active users. Promote that behaviour through your emails. Educate customers about using your product. And keep them on board with regular product updates. Good luck! If you’ve got any questions or need any help, please post a comment below or get in touch.